Satlof’s collection began in earnest in 1987: a $90 autographed copy from “a record dealer in an antiques mall on Canal Street,” with a scrawled signature that the seller said was Warhol’s, but turned out to be Reed’s. Satlof casually picked up more of the albums over the years, paying “$10, $20, like $100 for ones with the full banana.” He stresses that his hobby is due to the brilliance of the music and his love for it. But really: 800 copies? Each miniature synthesizer is meticulously handcrafted from framing matboard, cardboard, paper, plastic sheeting, string and rubber bands. Rather than replicating the existing machines, the focus was more about creating a revisionist history where analogue technology continued to flourish uninterrupted. Some of the best making-of-the-album stories are those where a wild, remote or inspiring location becomes a powerful inspiration on the music-making – The Rolling Stones at the Cote D’Azur mansion Villa Nellcôte for Exile on Main St.; Can at Schloss Nörvenich for Tago Mago; Killing Joke inside one of the Great Pyramids at Giza. In those cases, the band brought their own recording equipment with them. For the less intrepid, the world has many ready-made, custom-built, luxurious studios in gorgeous locations to fire up creativity. While evidence suggests HM01 is operated by the Cuban government, it’s virtually impossible to tell who it’s sending to, which is one of the main tactical advantages of numbers stations: You can easily see the intended recipient of an email, but you can’t prove someone listened to a radio broadcast unless you catch them in the act. Shortly before his death, Russell and his family took a small boat out to Baker Island, a flat rock half-covered by seaweed, four miles off the coast of Maine. The musician sat on a slab of granite and recorded the sound of the waves breaking against the shore. The next year, the Russells scattered his ashes from the same rock, and they watched as the waves slowly pulled him away. On summer nights, for decades, unbeknownst to Russell or his family, locals have boated out to this same rock. They play music, and move together under moonlight. They call the place the Dance Floor. Writer Stephen Thomas Erlewine has tackled a fascinating (to me) subject for Medium’s Cuepoint: the odd collision of classic rockers and the emerging ‘new wave’ in the late ’70s. Three or four years after the revolution, all the upheavals of the back half of the 70s were no longer contained in the underground. Disco and punk, synthesizers and drum machines, hip-hop and new wave — these strange new sounds started to seep into the mainstream and not just through new acts. Baby boomers facing their forties decided to try to dig the new breed, albeit on their own terms. Of all these odd records reckoning with new wave, none were as surprising as Paul McCartney’s McCartney II. Decades later, its cloistered, claustrophobic single “Temporary Secretary” can still startle and so can its accompanying, misshapen album. On “Temporary Secretary,” McCartney sets his whimsy — which arises in the form of a rhyming, murmured sing-song appropriated from Ian Dury — to a frenzied synthesized loop that undercuts whatever cutesiness he utters. Sounding like a computer in collapse, that loop leaves the lasting impression that McCartney really was attempting to be fashion forward. The results of these pre-synth era artists coping with onrushing trends would make for a fun compilation album … has anyone done this? Anyway, this is a fine article and worth some time and thought. In his documentary “Discovering Electronic Music” director and writer Bernard Wilets explores the basics of early analog synthesizers and the first digital sampling techniques. With its dreamlike and slightly dated approach, it’s a worthwhile watch— and if you’re curious about how future technology was referenced in the past, this short documentary is every paleofuturist’s dream. Update: Here’s a handy GIF I created from this video. Here’s a fantastic article in Collector’s Weekly with a selected history of the synthesizer, focusing on Dave Smith of Sequential Circuits who just got the old name back and is restarting the brand. In a word, synthesizers in 1974 sucked. Sure, their vintage cred looks cool from 2015, but all synthesizers in 1974 were monophonic, which meant they could only produce one note at a time. That was a major headache if you were Wendy Carlos and you had made it your mission to include a composition such as Johann Sebastian Bach’s “Brandenburg Concerto No. 3” on “Switched-On Bach.” Because her Moog was monophonic, Carlos had to play the notes for each of the concerto’s nine stringed instruments—as well as the harpsichord part—one at a time. Worse, Carlos was forced to play each note in each of the chords any of those instruments might be required to produce one at a time, too. 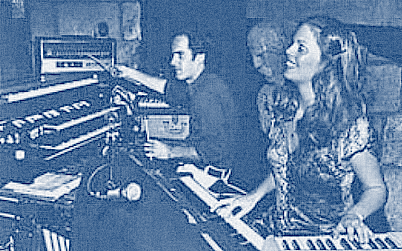 As if that limitation were not hobbling enough, early synthesizers, including the Moog, were notoriously bad at staying in tune, which meant Carlos typically had to work in bursts—often lasting no more than 5 seconds at a time—before the tone she had found by twisting one knob this way and another that way had degraded. Once a clean burst was recorded, the tape would be rewound, cued up, and the next burst would be added in real time. It was a painstaking procedure, requiring endless takes. In retrospect, that a project like “Switched-On Bach” was completed at all is something of a miracle. The article is a bit of a ‘long read’ but is totally worth it.